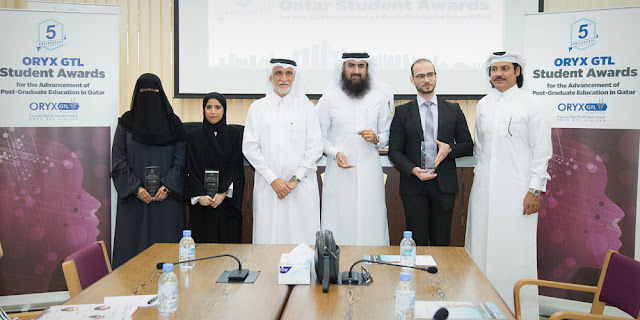 Doha, Qatar – May 8th: The 2018 ORYX GTL Student Awards for the advancement of post-graduate education celebrated a clean sweep of Qatari winners in all categories in the commemorative 5th-anniversary edition of the accolade presented at Qatar University today. The 2018 class of ORYX GTL Student Award winners, who are recognized for their contribution to help build a knowledge economy in Qatar, were all educated at Qatari universities. Mr. Abdulqader Al-Khouzaam, M.Sc. in Environmental Engineering, and Ms. Shifa Shaikh, M.Sc. in Environmental Engineering, who are both from Qatar University, were recognized in the Masters category, while Mr. Khalid Al Khoori, Ph.D. in Sustainable Energy, Hamad bin Khalifa University (HBKU), and Ms. Dhabia Al-Mohannadi, Ph.D. in Chemical Engineering, Texas A&M University at Qatar (TAMUQ), were recognized in the top tier award section of PhD. "I believe that my research addresses a problem that is not only important to Qatar but globally where we are faced with ambitious emission reduction targets, depleting resources and increase of demand as the earth’s population continues to grow,” said Dhabia Al-Mohannadi. “I hope that my studies and research will help me gain better skills to help achieve Qatar’s long-term national vision by fulfilling my responsibility of using my experience and education in the best way possible." For more than a decade, Qatar has demonstrated a brave commitment to innovative research and development towards a knowledge economy, which has focused in on the country’s grand challenges of energy security, water security, cybersecurity, and health. More of that pioneering spirit and partnership, shown by the ORYX GTL Student Award nominees, combined with new technologies, will be needed going forward as the country prepares to sustain and further advance the production of its natural resources. Each year a distinguished group of celebrated global scholars are invited onto the International Selection Review Committee for the ORYX GTL Student Awards to judge all the nominees, and this year’s panel of experts was led by Dr. Iain Macdonald, Senior Programme Manager, Qatar Carbonates and Carbon Storage Centre, Imperial College London. The committee also included Professor Mariam Al Maadeed, VP For Research & Graduate Studies, QU, Dr. César O. Malavé, Dean & COO, Texas A&M University at Qatar, Marwan Khraisheh, Senior Research Director, QEERI – HBKU, and Dr. Abdul Sattar Al-Taie, Executive Director, Qatar National Research Fund. The Selection Committee members were recused from reviewing any nominees submitted from their own academic institutions. "Maximizing Qatar’s post-graduate skills is vital to the country’s transformation into a knowledge-based economy as per the National Vision 2030, which is the foundation principle as to why ORYX GTL is backing the Student Awards for the Advancement of Post-Graduate Education in Qatar,” said Mohamed Al Enazi, Chief Administration Officer at ORYX GTL, and a member of the review committee. “Qatar is home to many innovative and critical thinkers, who are dedicated to using their talent and knowledge to support the country’s innovation ambitions," said Al-Enazi. Qatar hosts more tier-one U.S. universities than any other country in the Middle East and North Africa (MENA). There are 6 Tier-1 U.S. Universities in Qatar, which have largely been championed by the non-profit organization, Qatar Foundation. The Foundation has also worked over the last two decades to develop frameworks that unlock human potential and boost the number of home-grown academics. This year’s Four Qatar-based post-graduate students beat out global competition that included submissions from Imperial College London, University of Southern California, Herriot-Watt, Manchester University and HEC Paris.